Trinidad Scorpion Chili Butter recipe will add zing and flavour to any dish.Its just the thing to serve with meat , seafood, chicken What could be easier or more satisfying? 1. With an electric mixer, beat together all ingredients until mixed well. 2. 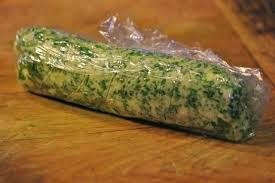 Spread mixture down the middle of a piece of waxed paper and form into a roll about 1 1/2" thick; refrigerate or freeze until solid; cut into 1/2" slices for use.